The statue to the left is, Fairoaks Red Tailed Hawk (Atreyu and Ronita), certified FEMA Search and Rescue dog. Hawk and owner/trianer Kathy Schiltz spent 11 days at the Twin towers. 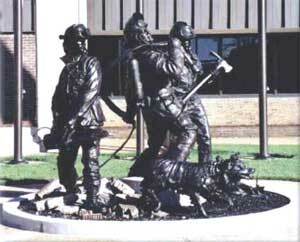 He is immortalized here, in this breath taking life size bronze statue, decorating the entrance to the Boone County, MO, Fire Protection Headquarters.